The National Youth Violence Prevention Resource Centre argues that an estimate of 30% of American youths are either bullied or targets of bullies. Unfortunately, bullying is no longer just in the playgrounds, hallways and schools. 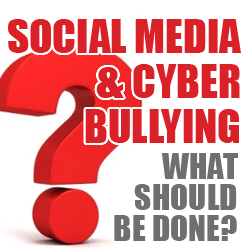 With the advent of today’s technology, bullying has now extended to almost every facet of life, including on mobile phones and social media. Take the Ryan Halligan Case. Ryan suffered from speech, language and motor skills development issues, which led him to be placed in a special education classroom from pre-school to the 4th grade. His struggles made him a target of bullies. A fight in 2003 between Ryan and a bully not only fortunately led to a supposed friendship. That friendship was short-lived and soon there were rumors that Ryan was gay. In fact, his “friends” decided to pretend to be a girl who likes Ryan on AOL chat simply to make fun of him. On October 7, 2003, Ryan hanged himself in his family bathroom. Take Tyler Clementi as another example. He committed suicide on September 22, 2010 by jumping of the George Washington Bridge. At the age of 18, he decided to come out of the closet. His roommate decided to use a webcam to stream footage of Tyler kissing another guy and shared it via Twitter feeds. The roommate was eventually charged with invasion of privacy and only served 15 days of his 30 day jail sentence. Izabel Laxamana jumped from a highway overpass after her father publically shamed her on YouTube in June of this year. He posted a video of him cutting off her nails as punishment for an undisclosed behavior. She was just 13 at the time. Another 14-year old girl was found hanged in her bedroom after receiving hate messages on her ask.fm page where they requested her to cut herself, drink bleach, and kill herself. In this social media platform, the users are allowed to remain anonymous when asking questions. Although some of the bullies were identified and some even came forth and apologized, the teenager already took her own life because of the effects of cyber bullying. You would think that people are using social networks to increase contact with friends and famous people and engage in increasingly positive social activities. However, our research shows that young adults with a strong social media presence are more likely to exhibit narcissistic antisocial behaviors and excess use of it was founded to be strongly linked to underachievement. So if you take over 2 billion Facebook users and 450 million of those are suffering from mental disorders, you get a global pandemic that is showing no signs of slowing down anytime soon. Several studies have found that social media – particularly Facebook – can have negative effects on our quality of life. Researchers from the University of Michigan evaluated Facebook usage over a fortnight and found that the more people that used it, the more negativity they experienced; as well as over time, experiencing higher levels of dissatisfaction with how they were living. A blog published on Everyday Mindfulness exposed a captivating concept known as the ‘discrepancy monitor’; “a process that continually monitors and evaluates ourselves and our current situation against a gold standard.” I encourage you to read it thoroughly! In summary, the article argues that we compare our own experiences against what we believe we should be experiencing. But when comparing our own life situations against that of social media, we become our own worst enemy – as the digital persona depicted on our social networks only highlights the ‘best bits. Be careful. There are so many great uses of social media and I’m an big supporter of online support and communities. But make sure you use them for engagement, conversation and support and not just for making comparisons and giving your mind even more to ponder on. It does enough of that by itself!